Eli Lowenstein has been murdered, and Sam Murray wasn’t the man who took his life. But when the accusers threaten to look in his saddle-bags he remembers the strange noises he heard that morning, and the talk of planted evidence that had condemned Ephraim Harris to an untimely lynching. If the evidence is in his saddle-bags, he’s sure it can only have been planted by Gar Newberry and he’s also sure that if they find anything he’ll swing from the end of a rope, just like old Ephraim. And there’s no way Sam Murray is going to sit back and let them slip that noose over his head…. Billy Hall beautifully mixes ‘whodunit’ and western and comes up with a very difficult to put down read. The book opens with a hold-up and a cold-hearted killing that leads to a lynching. Even though the reader knows the hanged man wasn’t guilt, Billy Hall keeps the identity of the real killer a mystery, a shadow that plants evidence and whispers names. A second killing brings feelings of guilt to those who formed the lynch party and soon local trouble-maker Gar Newberry is suspected as being the one who is framing others. Again Billy Hall presents these suspicions well, cloaked in believability. And even though the reader might have his own ideas as to whether Gar is guilty or not, and may even have an idea as to who the real killer is, I’m sure, like me, you’ll not guess the reason behind the murders. Sam Murray finds himself out of his depth as he tries to discover who the killer is whilst staying one step ahead of the lynch mob – helped unbeknown to him by a second shadowy figure with an as yet unexplained motive. Sam also has time to fall in love and the young lady in question will also find herself in deadly danger before the killer is unmasked. I’ve read a number of Billy Hall’s books before (he’s written at least 30) and have always enjoyed them. This one is right up there with his very best and offers a superb mix of action and suspense, which makes for a gripping read. Duel of Shadows is out now and I’d urge you to get your copy as soon as possible as BHW sell-out very quickly. Al Murphy was the law in a boom town gone bust, all that stood in the way of chaos on the dusty streets of Cincherville, Colorado. He’d made peace – at a price – with the rowdy drunks, the hard-case gamblers, the tapped-out miners still looking for gold. Then a 12-year-old girl was found raped and murdered in the town’s livery stable. Grimly Murphy searched for evidence, looking into the eyes of people he knew – or thought he knew – stalking a killer in a town gripped by terror. A killer who struck without mercy, without warning, driven by a lust for power and gold. 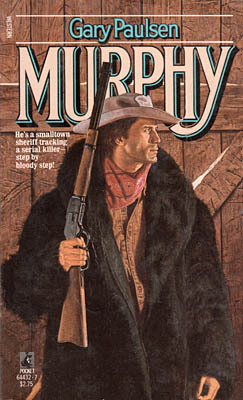 A cold-blooded murderer who piled death upon death, trying to cover his tracks, until Murphy ran him to the ground…. This is the first book in a short series and a memorable opening story it is. Filled with powerful writing that combines suspense, pain and the small rewards of justice, Gary Paulsen effortlessly keeps the reader turning the pages in the quest to discover who the killer is. With savage acts of violence and the discoveries of new corpses, Murphy has his mettle tested to the limit. He finds small clues but cannot see how they fit together, finds himself sickened by the brutal acts he witnesses, and questions his ability as a lawman. Gary Paulsen neatly includes mention of the new methods of fingerprinting; a technique Murphy finds hard to believe could possibly work. A fair amount of this book reads like a dark detective novel but it never loses its western spirit; at no time will the reader forget he’s reading a western. Tough, brutal, fast moving and gripping are words that easily spring to mind when describing this book. On finishing this story I was left wanting to immediately read the second book in the series to find out what happens next to those who were left alive. The journey begins as an ordinary trail drive from Texas to the railroad in Kansas. But it soon turns strange – and then deadly – as the campfire becomes a shooting target and rustlers try to steal the whole herd of steers. The crew beats them off and completes the drive, but back at the ranch in Texas the violence continues. The ranch owner seems to have become a sitting target and there are rumblings that the owner’s son and his sister’s husband do not get along. Whoever is out to ruin the ranch and kill the owner must be discovered, especially as a final deadly cattle stampede threatens to settle the matter once and for all…. Chet Cunningham is a much published author and his experience shines through in this gripping tale to bring an end to the assassination attempts on the ranch owner, Gregory Hardy, and to discover just why he’s become the target for unknown riflemen. Most of the story is told from the viewpoint of the son, Matt Hardy, as he struggles to make sense of the danger his father faces. During this time Matt manages to get involved with the girl of his dreams but can this affection become anything more as the shootings escalate and keep Matt and Francine apart? Chet Cunningham writes believable dialogue and his many action scenes are very visual. The story also throws up one or two surprises and the final confrontation, and how Matt deals with the outcome, makes for an excellent ending. 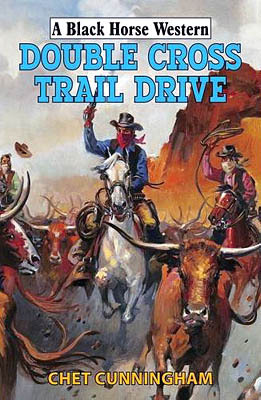 Double Cross Trail Drive is Chet Cunningham’s fourth Black Horse Western and I, for one, hope it isn’t too long before his fifth appears. The book is officially released at the end of the month but is already available from Internet bookstores. At the outbreak of Civil War, regiments stationed along the Oregon Trail are posted back East to fight for the Union. Hastily assembled militia units seize control of the trail forts and wagon trains are left vulnerable to exploitation and attack. Halted with a broken axle, westbound pioneers Eve Maddison and Wesley Jackson encounter a mysterious frontiersman known simply as ‘Stranger’. They also run up against the vicious Viperine brothers, in charge of a local militia and plotting to extort money from the stranded pioneers. Stranger insists that everyone is judged by their actions on the trail. His philosophy of courage and self-reliance inspires Eve and Wesley to make a stand against the Viperines – and face up to some difficult truths…. At first this story seems to be the standard tale about standing up to those running a protection racket, but as I read further into the tale it became much more as Eve’s past is slowly revealed and becomes a lethal threat to her and Wesley’s future. How this will be solved proves to be a great hook that kept me turning the pages. Rob Hill has created a group of strong characters in Eve, Wesley, Stranger and some of the people who work in the fort. The story rotates around Eve and I soon found myself caring about what would happen to her and her companions. How can a small, scar-faced woman stand up to the brutal Viperine’s who think nothing of inflicting pain, framing people for killings, and stealing from the helpless? And once Eve seems to be gaining control more secrets are exposed in an unforeseen, by me, twist that proves to have a deadly sting-in-the-tail. Judgement Trail is officially released at the end of the month but is available now from the usual Internet bookstores. Sam Blaylock fights to save Rancho Diablo. Has a dead man returned to take revenge against Sam, or is there something more human at work? Even the law doesn't seem to be on Sam's side as he takes on enemies that strike in the night. In this story Colby Jackson picks up on some of the threads left dangling at the end of the first book in the series and introduces a supernatural slant to the events. Can the attacks on the Blaylock family really be the work of ghosts? At least one of the Rancho Diablo hands believes it is and does his best try to convince others that it is so, this results in some humorous conversations, and also allows the author to include some suspense filled situations such as when the ranch hands attempt to track down these ghosts. Sam Blaylock’s relationship with the town of Shooter’s Cross citizens is also explored further, particularly that with the newspaper owner and the sheriff. Trouble for both of them is that when someone threatens Sam’s wife and children he isn’t going to let them, or anyone else, stand in his way of dealing with his enemies, be they living or dead. The writer behind the pseudonym of Colby Jackson this time around is Bill Crider and he fills this story with action and intrigue making this a difficult book to put down before discovering just how Blaylock deals with these new threats. Like the two books before it, this is a self-contained story that continues to flesh-out some of the main characters and also ends with a couple of unresolved issues that I expect will be explored in later books in this highly recommended series. 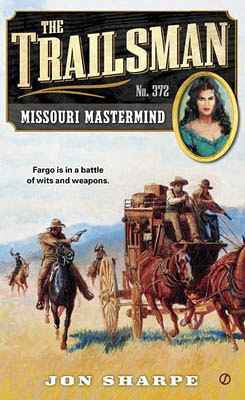 Saint Joseph, Northwest Missouri, 1861 – where Skye Fargo discovers that beguiling beauty disguises unspeakable treachery. 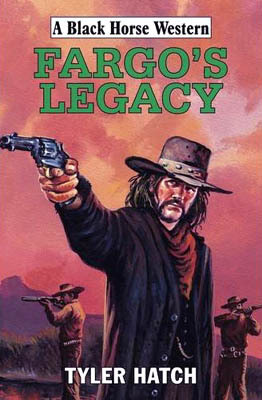 When Allan Pinkerton asks Skye Fargo to infiltrate a small gang of brutal killers, Fargo has no idea what he’s in for. The gang is only a tiny piece of a much bigger syndicate that has its filthy hands in a lot of pies – and it’s up to the Trailsman to climb the low-life ladder and take down the head honcho…if someone doesn’t take Fargo down first. Jon Sharpe fills this book with a twisting tale of intrigue where Fargo struggles to discover just who is behind the syndicate and then to prove his suspicions. To do this he has to resort to bluff and wits rather than the use of a gun. 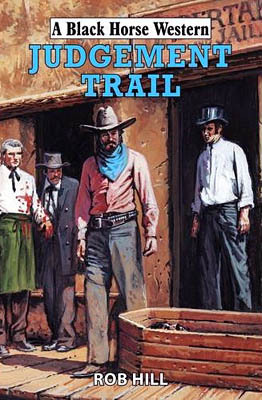 In fact there isn’t anywhere near as much gunplay in this story as found in many other Trailsman books. What you get is a well thought out plot and a lot of dialogue, the latter written in old pulp style speech that took me a little time to get used to. This along with Fargo calling his Ovaro ‘Old Campaigner’ and ‘Old Warhorse’ points me to believe the author behind the pseudonym of Jon Sharpe this time around is John Ames. Once I’d got the hang of the speech I found this to be a gripping read as Fargo came up against a group of fascinating characters, none of which he could trust, some of whom seemed to have guessed his real purpose yet chose to let him live but for what reason? Then there’s the mystery as to who is taking sniping shots at the Trailsman? And who brutally kills a young woman? Finding out the answers to all those questions above, and more, made this a hard to put down book which in turn made this story a pleasurable and entertaining read. Here's the third part of the list of series and sequel westerns that I have (or have had) in my collection. Click the label at the bottom of the post to find parts 1 and 2. Fans of Peter Brandvold will have already met Spurr Morgan a couple of times, in both books written under his own name and his pseudonym of Frank Leslie. Now Spurr gets his own series and let me quickly point out you don’t need to have read those previous books to fully enjoy this one, as Peter gives you all the background you need on Spurr’s history and fleshes this out with more of the aging lawman’s back-story. This book is peopled with a terrific set of characters, Clell Stanhope being particularly memorable due to his tattoos (I’ll leave you to discover what they are). There’s also Erin Wilde, a woman driven to insanity, and, of course, there’s Yakima Henry who rides off the pages of his own series to provide some much needed help. Craig Fargo was barely fifteen years old when he killed his first man. By doing so he saved his father’s life – but only for a few more minutes. And in those minutes he was committed to a quest that would take him eight brutal years to complete. The road is long when you’re alone, and that first dead man had a lot of company as Fargo’s legacy kept his fists ready and his guns blazing. 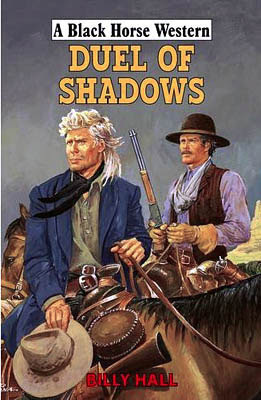 But when he reached the end of the trail and the gunsmoke cleared, his legacy was not what he expected…. This book begins with the killing of Craig Fargo’s father that sets the young man on his quest, following a trail that doesn’t really make any sense to him, that gets stranger as those he seeks are dying just before he finds them. Who is killing them and why? It’s these questions that kept me glued to the pages as Tyler Hatch expertly keeps the answers hidden, heightening the mystery elements of this very fast moving tale. Tyler Hatch is one of the pseudonyms used by prolific author Keith Hetherington, and this book contains one of his excellent brutal fistfights. There is also loads of gunplay and a superb villain – someone I’m not going to say anything more about so as not to spoil anything about the gripping plot. A mistake provides a slim opening and a dramatic race against time that begins to put the pieces of the puzzle in place, leading to a terrific final confrontation that ties everything up neatly, and violently. So, once again I’ve found myself being thoroughly entertained by a Tyler Hatch book and am left very much looking forward to Keith Hetherington’s next novel. When the mysterious mountain man Wolf comes down to a Crow village to return one of its wounded, the Crow wonder whether he is a man or a spirit. Wanting no part in the rampant war in the western plains, Wolf is set on returning to his mountain refuge. But his journey home is interrupted by three desperate women who need his help. What Wolf doesn’t realize about these women is that they aren’t what most people would call ladies. His innocent association with these prostitutes leads to a near-deadly fight that ends with a charge of attempted murder. 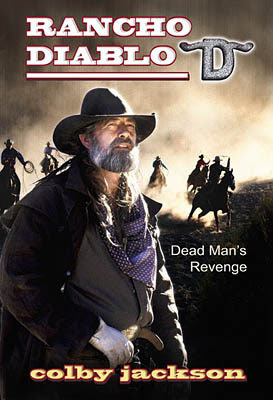 Chased by the most experienced deputy the marshal service has, Wolf leads him to the Black Hills, where their final showdown can only end in blood…. 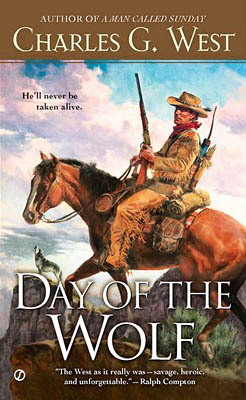 Charles G. West creates a superb air of mystery about his lead character, Wolf. Is he man or spirit? Where does he come from and who is he? Of course these questions are answered as the story evolves, and in turn lead to more questions about his future and that of the Black Hills as the discovery of gold lures all kinds of people there for different reasons including the three women who will have a big impact of Wolf’s life from the moment he finds them. There’s plenty of action as Wolf finds himself being hunted by a variety of people, many of whom he has no idea of why they want to kill him. Wolf becomes the victim of circumstances that he cannot control and becomes the unwitting target for vengeance seekers. Even though he doesn’t understand why these people want to kill him he is more than able to deal with them. And amidst all the struggles for survival could Wolf be on the verge of taking up a new way of life? Certainly one of the three women he helps hopes so even though he isn’t responding to her advances, doesn’t seem remotely interested in her. The outcome of this romantic storyline is never predictable and offers another intriguing story thread to this excellent book. 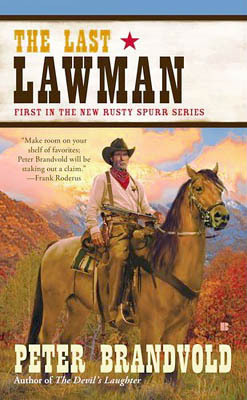 Well written this hard to put down book proves to be a very entertaining read that should appeal to all western fans.